Boy I could not remember at all how to fold a paper boat, I had to google the instructions. I have a recipe for sweet potato fries, but fries to me isn't a snack. For a snack, I want chips! In addition to being a Hell's Belle and this season's co-captain of Second Wind, Tay is a professional baker and knows stuff and also has some fancy stuff that I don't have. Like a mandolin, and sea salt, and walnut oil. Ha ha. I have decent knife skills, so I was able to slice the chips just about a sixteenth of an inch thick by hand. I forget what I have all this kosher salt for—oh, the preserved lemons and oranges—but I've started cooking with it instead of table salt, and it does taste better; so I used kosher salt for this. Tay said she tried olive oil vs walnut oil, and walnut won. I tried coconut oil, which I have tons of, and that was delicious. 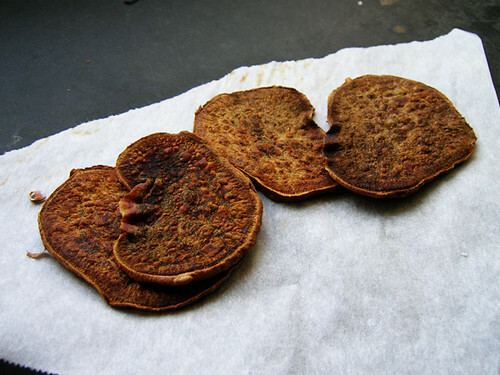 Also these are supposed to go with zucchini hummus, but I was unable to organize myself to make sweet potato chips and zucchini hummus at the same time. TK! Wash and dry the sweet potatoes, cut one end off and slice thinly with a mandolin. 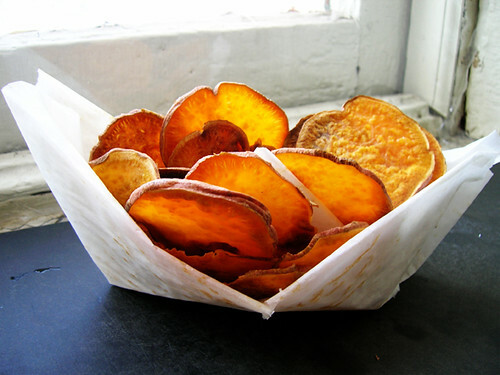 Put the chips in a bag with walnut oil and shake, lay them out on a pan covered with parchment paper and sprinkle with sea salt. Oil the bottom of another pan of the same size and put that on top—this is the cool part! Tay says, "this way the whole chip is touching a heat source and not just in the air," so they bake evenly and don't curl up, omg science. Tay didn't say omg science, that was me. Bake for 10 minutes, rotate the pan, and bake for another 10-15 minutes until they start to brown. At this point, they start turning into chips for real and sort of fast. I started picking the done-looking chips off the pan about every minute or two; you want to get them off the pan just as they turn and before they burn. Let the chips cool and crisp up a bit.